Teaching, learning and technology....... Putting the pieces together. It is not the answer that is important but how you got there. Over the past week I have been in quite a few classes working with students on their mathematical thinking. Specifically, 'Number Talks' and how they mentally process numbers and the different ways to do it. What an experience it has been. The whole idea is to let the students do the talking and learn from the ideas of each other. I have found this incredibly difficult. How many times have you had to stop yourself from interrupting or interjecting during a classroom discussion? I know that this is something that I have had to work so that students can learn from their own thinking and the thinking of others. There has been a huge amount of learning at our school this week! The learning has not been done all by the students but the process we as a staff are moving through to examine and discover student thinking. After each classroom session there has been just as much professional dialogue going on as there was dialogue with the students around the Number Talk. Ideas of where to go next, insight on where certain students are in their learning and discussion on how to extend the mathematical thinking of these students. This approach to teaching and talking about math in the classroom is relatively new to me. After working with just a few groups of students I can really see how this can benefit each and everyone of the students at our school. I am hoping that others feel the same way and continue with these talks with their students a few times a week and we can deepen the students mathematical thinking. After going into a few different classrooms and doing a 'Number Talk' with the students a few things are becoming quite clear. We have some incredibly smart students in this school! Our students have been taught some fantastic strategies to work with numbers. All of our students are benefiting from 'Talk Moves'. There is no question that I am learning just as much or more from working with these classes on 'Number Talks'. This is an amazing thing and each time I listen to a student speak or go into a class, I know that I am slowly getting a better understanding of student mathematical thinking each and every time. One of the challenges I have faced over the past few days is biting my tongue and not adding to a student's verbal answer or guiding them in a certain direction. This is where the talk move comes in. Redirect it to another student or ask another student to rephrase what their classmate just said. My favourite may be this one: Do you agree with what _____ just said? So many times what you wanted to say is said by one of the other students. I think that this is a very powerful thing. For too long educators have been the giver of knowledge. During these discussions, our students have been learning from each other and teaching each other. Powerful stuff! 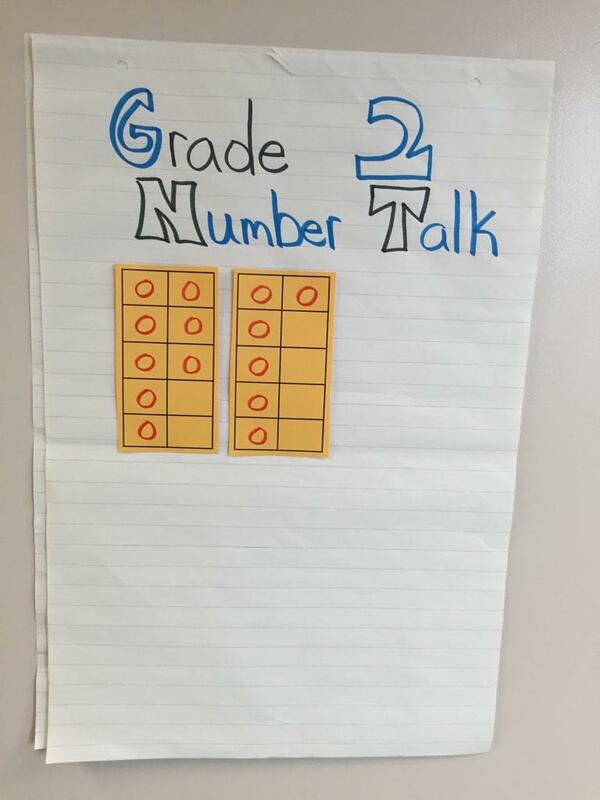 If you have any experience with number talks let me know about it. I'd love to hear how it is working in your school. Interested in learning more about 'Talk Moves'? Check out Lucy West. She has some fantastic videos and information on this area. ATTACKING NUMBER TALK WITH GRADE 2! One of the areas of focus that our school is looking at this year is student thinking in the area of math. I am sure for those of you in Ontario this comes as no surprise. One of the resources we have purchased to help with this is "Number Talks: Helping Children build Mental Math and Computation Strategies". Tomorrow morning I am headed into a Grade 2 glass to do one with the students for the first time. I have to admit that I am looking forward to it. Unfortunately, I do not get to be in front of a class teaching as much as I would like and this is giving me an opportunity to do it! Regardless of the results of tomorrow's 'Math Talk' I am going to offer my services to every class in the school to go in and do one of these lessons. I think there are lots of opportunities here in doing this and one of the most interesting things I am looking forward to is examining the thinking of our students in math. Has anyone else had any experience with Number Talks? WHEN SOMETHING ISN'T WORKING: Change it! Often we try to accomplish something and for whatever reason we just can't get to our outcome no matter how hard we try. As educators there are so many things that we do well each an every day. When we try to implement change in our schools we often try and revamp what we are already doing. This raises the question: Do we need to change or do we need to tweak what we are doing? I saw this video last week and thought it was too good not to share. It speaks to trying to reach a common goal and along the way things just were not working out. By incorporating some of the old ways with the news ways, we may be more able to meet the goals that were are trying to achieve. Have you ever reverted back to familiar ways of doing things to meet a new goal? At our last staff meeting at the end of June everyone chose a trinket out of a box I had collected. Tape, toy cars, paper lips, whiteout, candles, matches and other everyday items were in the box. We went around and shared why we had chosen each item. It was a great exercise and offered a glimpse into the lives of our colleagues. I chose an Internet cable and said I was unplugging from the computer for the summer as much as possible. Well I did it. If you check my twitter timeline you will see from July to the end of August it is practically nonexistent. The same goes for this blog. It is a good way to relax and charge your batteries and get ready for the next school year. You could miss something important and/or a great idea while you are 'unplugged'. I have determined that after this past summer I am more ready to come back to school energised and better off with this break. I'd be interested to know if anyone has any thoughts or ideas on this. Do you see the benefits of taking a step away when you are off for the summer? Do you find your vacation an excellent time to catch up on all the great things that are going on out there? We just had our Welcome to Kindergarten Night here at our school. This night was for parents to come and find out a little more information about the school and the full day learning program. Thankfully for me this was not an opportunity to lecture the parents for an hour on why our school is so great (and it is) and what we have to offer. Our night took on a different format. The best teacher(s) a child is EVER going to have is their parent(s). This is the angle that we approached learning from last night. Our school board, Ottawa Catholic School Board is in a partnership with the Learning Partnership. The whole idea is that we want to make sure that students have the school readiness skills by the time they get to school. If students come to school for kindergarten with some key skills this is a very good predictor of their educational success down the road. We also had community partners at the session to answer any questions that parents may have had. A nurse from Ottawa Public Health was here, a representative from First Words and someone from the Pincrest Queensway Resource Centre. After the Principal's introductory address the prospective kindergarten students and their parents could move around to centres. These centre's were set up by our kindergarten team and that demonstrated some activities that parents could do with their children to help get them ready for school in September. Students played with play dough, used magnetic letters on cookie sheets and cut up flyer's and glued the favourite objects onto paper. The entire night was a real success. Students and parents were actively engaged in all of the activities and were most appreciative of the hands on learning. We had 37 out of 43 registered students attend the session and we were amazed by the turnout! If the turnout from mothers and fathers is any indication of the level of parental cooperation and involvement that we are going to have over the next few years, we are very fortunate. Let's hope all parents engage their children playing learning games and giving them lots of learning opportunities before they enter school. If they do this research shows that we will all be well on our way to meet the needs of our students. I was having lunch the other day when I stumbled upon an #edchat about what the thoughts were on the "Big Shift" in education today. There were some great ideas thrown around surrounding best practices in teaching, technology, teaching to the test and so on. One "Shift" that kept being tweeted kept peaking my interest. It had to do with the HOW we are teaching our students. HOW are we teaching our students? Are many of us out there still treating schools as production facilities where all students are expected to exit the 'building' as a finished piece of work all resembling each other. Or are we making sure that the learning needs of each student is being met in our class or school? Just what types of skills are being taught to our students today? This Sugata Mitra TED video at the bottom of the post raises some excellent points and questions. Here is a question worth considering: The skills that we may be teaching our students may not be the ones that they are going to need in the workforce. Are the skills we are teaching lending themselves towards the workforce of today or yesterday? What kind of learning are we wanting to develop? It seems I am asking more questions than I am answering. However, I believe that they need to be asked, discussed and dealt with. This led to a discussion on how to go about teaching our students these skills. Teaching these skills will be a major change for teachers in how they run their classrooms and teach their students. A lesson, let alone a classroom, will have to undergo some pretty important transformations. I know we are up to the challenge and we are looking forward to the opportunities that will arise for us on our journey. Math Assembly an Educational Success! !